Updated as of 2019! Same great recipe, new pictures to show just how dang good it is. We like to double the chicken to make it extra hearty- noted in the recipe! Enjoy! I’ve had “white chicken chili” on my mind for some time now. It just feels like the lighter, fresher version of the usually tomato-based chili I already know and love- and it is good. 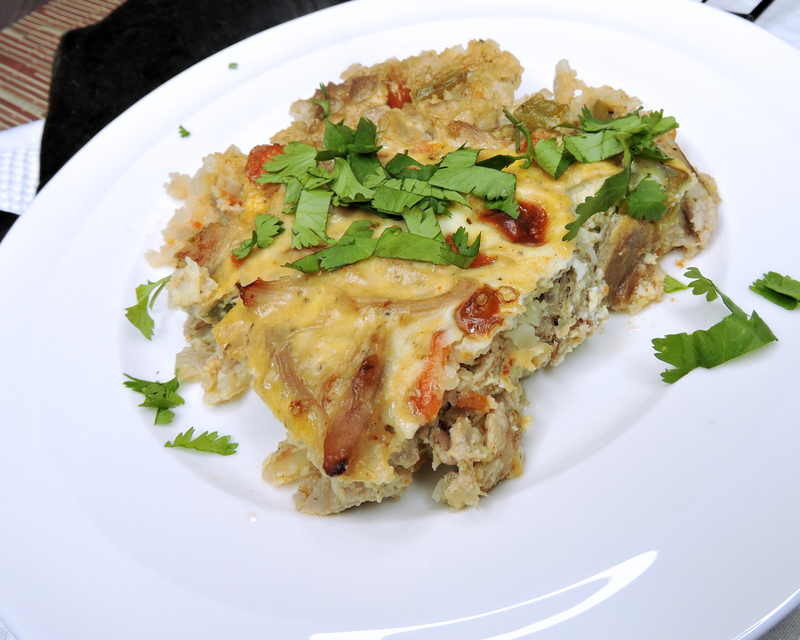 Once I got going with the recipe, though, I was inspired to put a “Beef Enchilada Bake” twist on it. 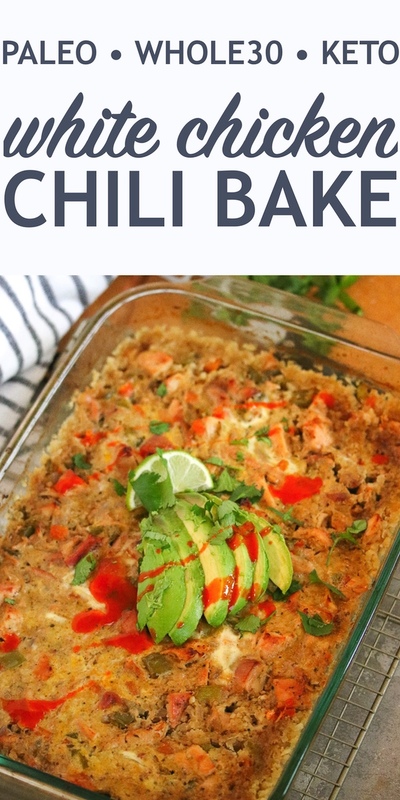 So, I made the “white chili” base, and poured it over cauliflower rice, stirred in a few eggs, and baked it until it was thick, creamy, and perfect. I’m so happy with how it turned out. 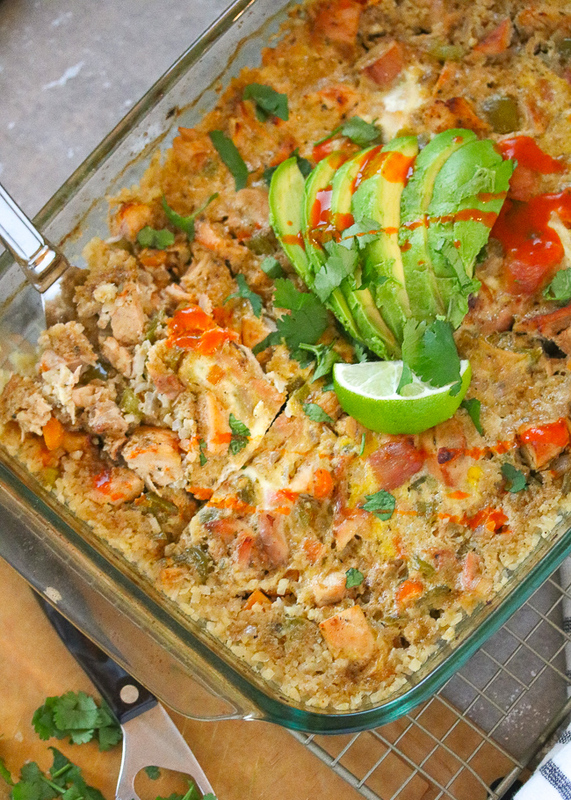 It’s bursting with authentic Mexican-inspired flavors, but the casserole element gives it an American comfort food vibe. I'm not sure how this looks to someone who hasn't tried it. Maybe it looks delicious, or maybe not so appetizing? But let me tell you, it tastes 1000x better than it looks. And I think it looks really good. In a large skillet over medium heat, sauté the onion, carrot, and garlic in avocado oil (or fat of choice) for about 5 minutes to soften. Add the bell pepper and spices & continue to cook for about 2 minutes, or until the spices are fragrant. Add the broth, coconut milk, & lime juice, and bring to a simmer. Stir in the arrowroot for added thickness. Add the shredded chicken, and season with salt & pepper to your taste preference. Drizzle the bottom of a 9 x 13” baking dish with avocado oil, to avoid sticking. Fill the bottom of the dish with riced cauliflower, then top with the chili mixture. Crack three eggs into the dish, and stir them in with a fork until the eggs are no longer visible. Transfer to the oven, and bake for 40-45 minutes, or until lightly browned around the edges. 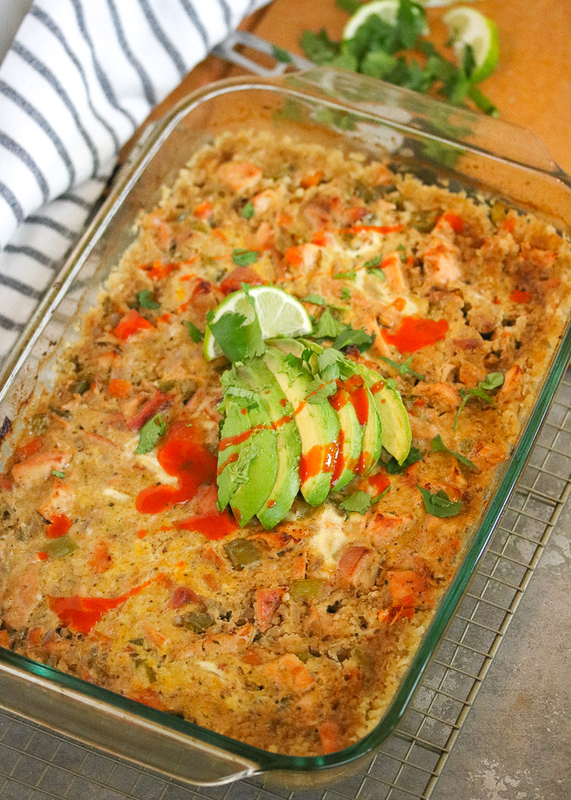 Allow it cool for a few minutes so it gets firm, then slice into squares & serve topped with cilantro, fresh lime, hot sauce, & avocado. Enjoy! If you don't have arrowroot flour on hand, try substituting 1 Tbsp of coconut flour. I used the frozen riced cauliflower from Trader Joe’s. One bag is the perfect amount & it was so convenient! Hey Jessie! This looks delicious. Quick question. I just discovered the frozen riced cauliflower from TJ's yesterday. Do you thaw it out first, or just throw it in frozen? I was worried about extra moisture. Thanks! I'm making this tomorrow night, but I'm not clear on the mixing in of the eggs. Do you try to mix them into the white chili only, or do you mix the cauliflower rice in as well? Please clarify. I mix them into everything. It doesn't have to be perfect~ the egg just helps things bind together a bit! I just crack them in, then mix in until you don't see them. Thanks Jessie B. I'm hoping this will be the 2nd way I can enjoy cauliflower. The 1st is your recipe for paleo pizza bites. Those were a hit! We also enjoyed your BBQ bacon meatloaf and Cyispy green bean fries. Think this would freeze ok? I made this over the weekend for my family, and everyone really loved it, including a non-vegetable loving husband and my 5 and 2 year old. 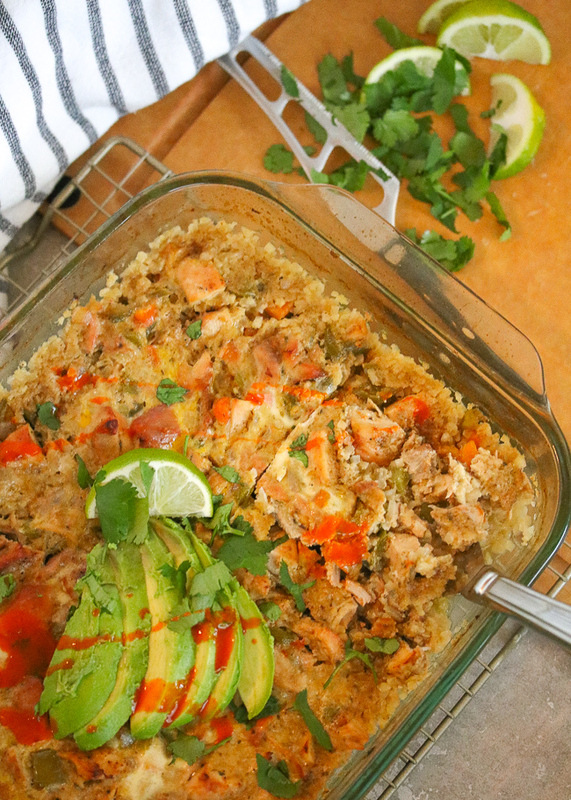 Really good, feels like comfort food, makes great leftovers, and will be a regular in our meal rotation. Thank you for a great recipe! Is the coconut milk canned? Could you use almond milk instead of coconut milk? Can you taste the coconut? Thanks! How do you think this would work with a different “riced” veg? I’m nursing and scared to eat cauliflower- I tried once and it was a rough night! Sounds so delicious! Thanks for the creative and healthy idea! I am always looking for new paleo and low-carb recipes. I post them on my site, too. Made this last week and we loved it! We had just a little over a pound of chicken from the rotisserie chicken we used and that was a good amount. Subbed a large zucchini for the bell pepper and turned out nicely. I like lots of spice so next time I will double them. 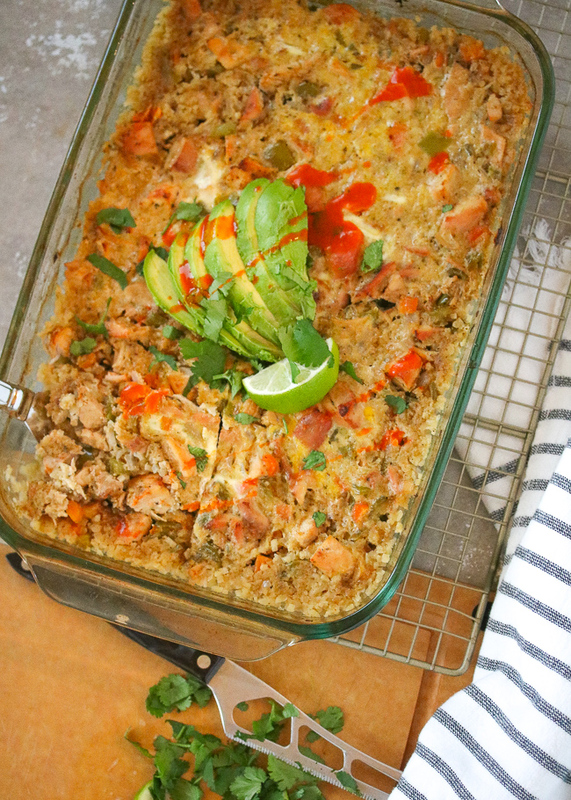 This would also make a great recipe for kids and you could hide some more veggies in it if you want to!